Learning how to brew your own coffee is an incredibly rewarding experience. If you’re looking to break into the coffee industry, or just want to make exceptional coffee at home, we’ve got you covered. Classes are held at weekends in our designated training room, located at 3fe, 7 Sussex Terrace, Dublin 4, which is kitted out with everything from the humble French press to state of the art professional espresso machines. Whether it’s a gift for someone in your life who is coffee-mad, or an investment in your future career, make sure to book early as classes are limited to six people and can fill up quickly. 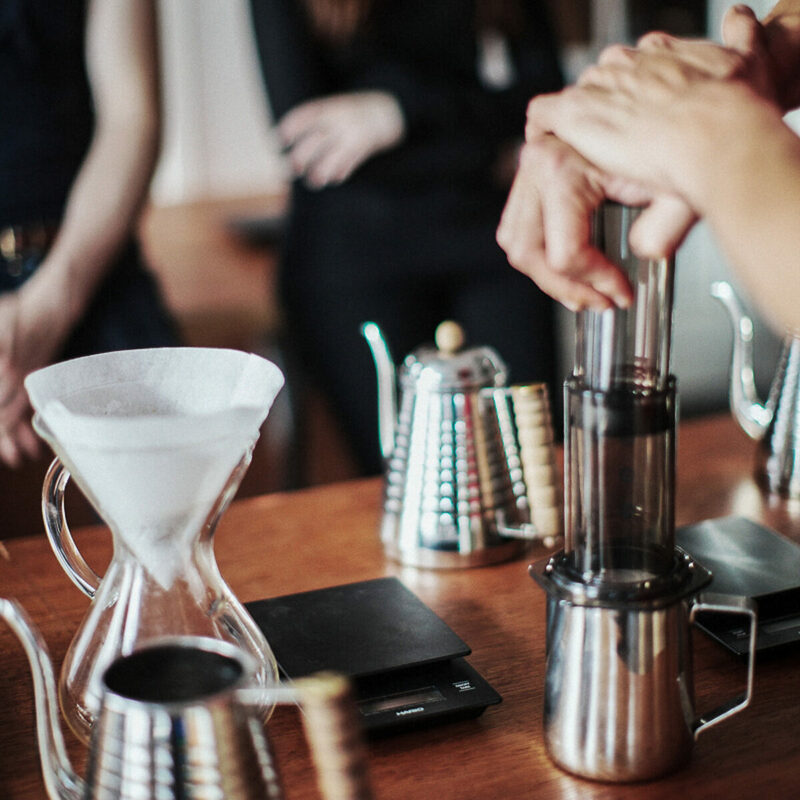 This informal class is a fun and friendly introduction to tasting and brewing coffee. Aimed at the average coffee drinker who wants to know more about what they’re drinking and how to make a delicious cup at home. The class covers everything from farm to cup and how all of this in turn effects the final cup that you drink. The class is quite hands on, with an introduction to a number of different brewing methods, tips and tricks for getting the best out of your brew, step-by-step guides and demonstrations,as well as a chance to try a variety of coffees from around the world. An in-depth look at coffee, focusing on espresso and extraction principles. Aimed at those considering the professional route, or just curious to find out what exactly is happening behind that espresso machine.The class focuses largely on the fundamentals of espresso brewing, and covers everything from milk texturing and latte art, to filter brewing, managing workflow and everything in between. The overall aim of the class is to get everyone hands-on, pulling espresso shots from professional machines, steaming milk and becoming familiar with the equipment and terminology, while also understanding the logic behind the methods. Included in class: - Introduction to coffee - Cupping (coffee tasting) - Introduction to Espresso - Espresso variables. - Espresso based recipes. - Using correct espresso preparation techniques. - Extraction Principles. - Building espresso recipes. - Steaming milk - Latte Art - Cleaning and caring for the espresso machine and equipment. - Best practices and top tips. - Snacks & lunch. You will take home: - A 3fe goodie bag - Detailed hand-outs of all of the course contents. - A 3fe certificate. - A new life skill. An entertaining taster into the world of espresso, covering all the basics involved in producing the perfect shot. The majority of this fun class is spent learning to pull espresso shots, steaming milk and making a variety of espresso based drinks.Although the class covers many of the topics covered in our main Barista Workshop, it doesn't delve into quite so much detail and is intended to give a totally hands-on, overview of using an espresso machine in a simple and enjoyable manner. Suited for the home espresso user or those who have always wanted to hop behind the machine with the barista when they order their coffee! Included in class: - Introduction to coffee. - Introduction to Espresso - Espresso variables. - Using correct espresso preparation techniques. - Espresso based recipes - espresso, americano- Steaming milk - Latte Art - Cleaning and caring for your espresso machine & equipment. - Best practices and top tips. - Snacks. You will take home: - A 3fe goodie bag - Detailed hand-outs of all of the course contents. - A 3fe certificate. - A new life skill. Spend your time learning the perfect technique for steaming milk, creating microfoam and pouring latte art designs in a fun and relaxed way. We discuss the importance of using high quality milk, correct temperatures, jug sizes etc. No previous experience is required for this class and we welcome those already working in a cafe who want to perfect their rosettas, to those who want to try their hand at replicating the perfect tulips they see when they order a cappuccino. As class sizes are small, each participant will get ample practice time, as well as lots of essential tips and tricks for improving your pour. Each participant also gets a goodie bag to take home with them. Included in class: - Components in milk - Temperatures in milk - Milk Hygiene. - Jug sizes and waste management. - Steaming techniques - Pouring techniques: Heart. - Pouring techniques: Rosetta. - Pouring techniques: Tulip. You will take home: - A 3fe goodie bag - Detailed hand-outs of all of the course contents. - A 3fe certificate. - A new life skill. Available only for participants of one of the 3fe classes or workshops (reference needed). Practice use of espresso machine, grinder and auxiliary items, as well as I kilo of coffee + milk. Custom build your own personal training session, where you can focus on where you will work one-on-one with our Barista Trainer, covering the specific topics and skills that you want to learn. Dates & Times arranged by email. Please email classes@3fe.com to arrange your spot.